Pound cake is a favorite of mine, but -- I've never attempted to make one this big. It really looks wonderful. Thanks for sharing the cute story and beautiful as the above reader expressed. That is one gorgeous pound cake Bonnie! I don't think I have ever seen one that big and tall! And I LOVE the story about your sister weighing the cakes--how cool that the newspaper printed the story with a cartoon! And Happy Mother's Day to you too Bonnie! I can't believe I forgot to post that!! That is one beautiful and very tall pound cake, so tall..I bet it could play in the NBA ;) Seriously though..I wish I could come over and have a slice! Happy Mother's Day, Bonnie! Beautiful texture, moist, dense, and buttery. Baked this yesterday, and I had to add 30 minutes to the 1hr-45min for the pick to come out clean. Oven temp was right, checked it with two thermometers. It's a mystery. But this cake is the closest to the pound cakes I remember from my youth as any I have tried. Thanks for sharing it. Hi Marsha! That is odd about the length of time your cake took to cook. My sister made it with perfect results. I'm not a food scientist; but when I had my house, I had the ovens calibrated by a technician. I see you used two thermometers...I know some are more accurate than others. I'm so glad you liked it, even though it took longer for yours to cook. Thanks for sharing your experience...please visit often! Hi, I'm new to baking. I have a question, you didn't have to add baking powder or salt to your all purpose flour? Can't wait to try this one! Hi Cheryl! This is a classic, true pound cake. There is no need to add baking powder or salt (I use butter w/salt anyway). The eggs are the raising agent in this cake (and it calls for a lot). I do hope you try it...it's so fantastic and versatile! If you have any more questions, please let me know. I try to write my recipes as if my daughter were standing beside me. Thanks so much for visiting, and sweet success! I just feel better if it sits overnight. I know then that it will be completely cooled and will release without coming apart. Also, it will not be gummy inside. I would say that it should be cooled a minimum of two hours. If you release a pound cake too early, it might taste good (warm), but differently. However, it may not release well, or it could crush easily and perhaps be a little gummy. Always cut a cake with a serrated knife, taking care not to smash the cake as you slice it! Thanks for your inquiry and reading my blog...good luck and enjoy! I used a 10" tube pan with a removable insert. Normally, this pan would be used for angel food cakes. Some angel food cake pans are one piece and don't have a removable insert. In my recipe, I recommended not using a Bundt pan, as the batter would overflow. If that's the only tube pan you have, you might try removing some batter (obviously, the cake would not be as tall as the one photoed). I've not made this cake in a Bundt pan, so I can't recommend how much batter to remove. Thank you for visiting my site and your inquiry. Please visit often, and I hope you enjoy! Not if you use the pan size recommended. Thank you for your inquiry, and please visit often! Enjoy! Can’t wait to make this pound cake! Thanks so much, Becky! Truly appreciate your visiting my blog and your nice comment! It's a marvelous pound cake...enjoy! You mentioned covering the cake with a clean Dish towel to make moist. Covering it in the pan doesn't make it sweat and stick? Hi Dee! Yes, it will help make the cake more moist, and it will not stick if you prepare the pan as I suggested. It will release easier if completely cooled overnight. Thank you for your question and have fun at the reunion! Please visit often! Would you leave this cake in the pan overnight if you don't use a removable tube pan? An you substitute almond or vanilla extract for the mace and still have the same results? Hi! I like to use mace spice in a lot of my recipes. It has a subtle flavor that some would find difficult to identify, yet it very pleasantly flavors the recipe. I prefer mace in this cake, but you could substitute ground nutmeg for something similar. The recipe already calls for vanilla and lemon juice. Thank you for your inquiry and enjoy! What does mace look like? Is it similar to vanilla flavoring? Hi B-Rob! It is a brownish, dry powder spice and generally comes in a small can or jar. Thank you for your inquiry and hope you visit often. Enjoy! Bonnie, I noticed that you didn't use any milk. Are the 8 eggs taking the place of the milk? Hello! Milk is not used in a classic pound cake. Some other pound cakes do use milk. Thank for your inquiry and enjoy! I love baking and get requests for pound cakes all the time. Have been wanting a tall cake recipe and you came through! Will try this one this weekend. Thanks. Hello Johnnie! So happy you share my love of baking! This indeed is the pound cake recipe to use if you really want a tall cake, plus it's so scrumptious! Thanks so much for your comment and visiting. Have fun baking this weekend and enjoy! I really don't like the cooking spray. I like to prepare my pans with crisco shortening and dust with flour. I have had very good success with the non-stick baking spray and find it easier to use. However, if you prefer the using the shortening and dusting with flour, I say go for it! Thanks so much for visiting and your comment. Please visit often and enjoy! I have ground cardamom, can I use that in place of the ground mace? So sorry, Lori, that I am just finding your question. It was buried within a lot of spam comments. In reply, I prefer ground mace and ground nutmeg would be the closest substitute. I have not tried ground cardamom in this recipe; however, it might be an interesting spice with which to experiment. 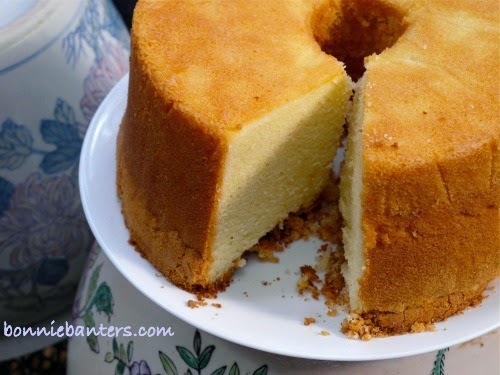 If you use it in this pound cake, please let me know how you liked it. Thank you for visiting and happy baking!